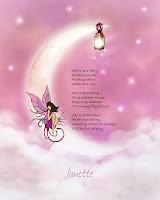 ©2011 Randi Kuhne, My Fairy Poems. All rights reserved. No other use without permission. Of who, where, and how. Come learn and grow wise. Tears streaming down from both her eyes. Why is her heart so very sad? What will make her soul turn glad? And wraps her in the warmth of sweet fairy love. When she shuns the white? Will be full of play. Save Mia fundraiser/auction, to help protect my granddaughter from domestic violence. Please participate in the auction if you can, or simply pass the link along to a friend! Thanks! They vanish with the tide. They rise up off the ground. Of the one he holds so dear. To all who've come to see. The sparks and sparkles fly! All worries are no more. With tales to tell and write.